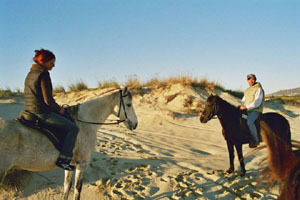 We offer tours on horseback around Agia Anna, Ag. Arsenios, Mikri Vigla and the beaches on the south-west coast. We try to give our customers the impression of the lovely nature of Naxos through amazing bamboo-paths, great views over the island and to give the feeling of being one with the horse.